VanPayar Thoran/ Red Cow Peas with Coconut is a great side dish for rice in Kerala. 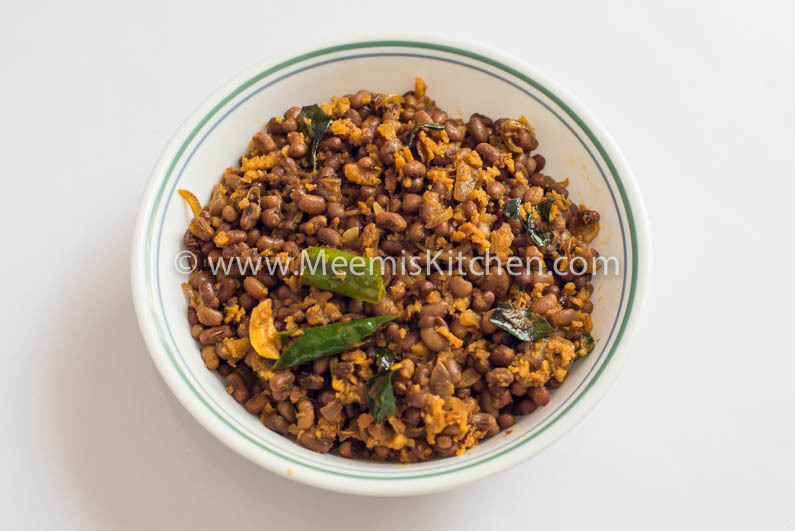 It is a very popular and common dish in all households in Kerala. VanPayar or CheruPayar are like our staple food and there are a variety of ways to cook these protein rich food. In our family, every other day this is an indispensable item in our menu, so, you can say it’s our kudumba (family) curry. 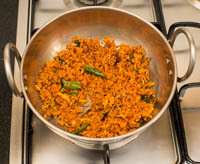 All varieties like VanPayar Ularthiyathu, VanPayar Churakka Erissery, CheruPayar Ularthiyathu, Sprouts Thoran, Vazhakoombu Cherupayar Thoran, Cabbage and Cherupayar Thoran, Vazhakka Cherupayar thoran, Vazhakka Vanpayar Puzhukku and Koottu Erissery are our favourite dishes. Van Payar or Red Cow Peas are loaded with nutrients, are rich in fiber, iron, proteins, vitamins and contains many anti oxidant properties. It also helps in digestion, aids weight loss and is great for your skin and hair. See more health benefits below. Usually we make Van Payar Ularthiyathu, but this Vanpayar thoran tastes even better. So here’s a different style VanPayar thoran, Serve it with any Pulissery, Mezhukkupuratti, and fish curry. Wash and soak VanPayar for a few hours.You may soak overnight also. Cook in pressure cooker with enough water( just to cover the peas). Cook for 3-4 mts after first whistle. Heat oil, crackle mustards, add chopped onion, slit green chilly, chopped garlic, curry leaves and sauté. Add turmeric and chilly powder and sauté. Add the grated coconut and salt and fry for some time. The water from coconut should dry up, but do not brown it. Lastly add Vanpayar. Add more salt if required. Toast for some time for the flavors to dig in. Enjoy with hot rice. VanPayar should be cooked without salt, or it becomes hard. Coconut should be little dry, toast for some time, not brown, to dry the water, before adding Van Payar. Serve with rice and other side dishes. It is great with all kinds of Pulissery. If you like it more spicy, adjust the green chilies or chili powder measure. It is an excellent source of soluble dietary fiber and protein, which play significant role in decreasing the amount of bad cholesterol present in blood. With high Magnesium levels, it is a great for controlling diabetics. The anti-oxidation property also guarantees curbing of the cancerous cells within the body. As it is low in calories, it aids in weight loss. High fiber content in Red Cow peas helps in improving digestive health. It has a high amount of anti oxidants, Vitamin A and Vitamin C, resulting in great skin and hair. Please try and let me know if you like it. Also, please share with your friends using the buttons on the side. Thanks and God Bless! !